The reign of police violence in the US claimed 16 more victims over the past week. On Friday, Christian Taylor, an unarmed 19-year-old black man, was killed in Arlington, Texas by a police officer who shot him four times. The officer, Brad Miller, was unharmed and has been placed on administrative leave. The same day, Matthew Russo, a 26-year-old white man, died after a Hartford, Connecticut police officer responding to a “medical-related disturbance” shocked him with a Taser. Just over a week earlier, Zachary Hammond, a white 19-year-old, was gunned down in a parking lot in Seneca, South Carolina. He was on a first date and the passenger in his car was eating an ice cream cone. An independent autopsy found that Hammond was shot from the side, contradicting police claims that he was attempting to ram an officer. These are only the latest in an endless series of cases in which unarmed workers and youth, posing no threat to the police, are gunned down, tasered or beaten to death. The police do their best to cover up the facts, often lying on incident reports. 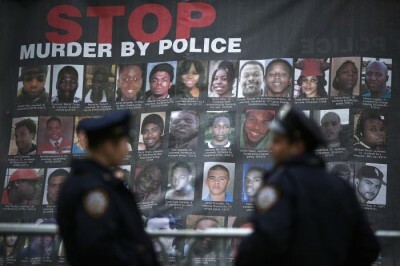 There have been so many unarmed people killed by police in recent months that it is impossible to list them all. It is one year since 18-year-old Michael Brown was shot dead by officer Darren Wilson in Ferguson, Missouri. Since then, 1,144 people have been killed by the police, or more than three per day. By way of comparison, fewer than 10 people are killed by police each year in Germany, and less than three in Great Britain. The political establishment, led by the Obama administration, has responded to growing popular opposition to police brutality with empty gestures of concern, while helping shield the vast majority of killer cops from prosecution and seeing to it that the killing machine continues. Despite the widespread protests that erupted last year, the rate at which people are killed by the police in the US has accelerated. Since the beginning of this year, there have been 705 casualties in this internal war, 45 more than had been killed by the same date last year. What accounts for the regularity of police killings in United States? Why is this national ignominy, which makes a mockery of America’s pretenses to be a beacon of democracy, so resistant to popular opposition? To the extent that the question of police violence is discussed within the political establishment, it is universally presented as a question of race relations, in which white officers kill black people. While there is no doubt that racist and other backward sentiments are encouraged among police officers, this official explanation ignores the fact that, according to a survey compiled by the Guardian newspaper, nearly twice as many white people were killed by police this year as blacks. Observing American society from the outside, as a doctor would observe a patient, one would conclude that the state, including the police and the military, is dangerously enlarged and inflamed. The symptoms of the disorder include not only systematic police brutality, but also the massive and overgrown prison system, an intelligence apparatus that spies on the views and communications of all Americans and carries out torture and assassinations, and a military apparatus that increasingly dominates domestic political life. The American state is led by a president who revels in carrying out extrajudicial murders, including of American citizens, and boasts about people who are “gone” thanks to the US drone killing program. Millions of lives have been sacrificed in the drive of the American ruling class to dominate the world, including in the seven countries where Obama last week bragged he had authorized military action. The violence and barbarism inflicted on the victims of US imperialism abroad are being visited ever more directly on working people at home. The growth of militarism has paralleled the cancerous growth of social inequality in the US, driven by decades of deindustrialization, financialization and attacks on workers’ living standards that have only accelerated under the Obama administration. Beginning with the manufactured recession of 1980–82 and the breaking of the PATCO air traffic controllers strike in 1981, the working class in America has been the target of three-and-a-half decades of relentless attacks. Over this period, the capitalist ruling elite turned from productive investment to the scrapping of factories, the slashing of workers’ wages and pensions, and the amassing of ever greater personal wealth by means of financial speculation. As a result, the number of manufacturing jobs in the US fell by nearly half, from about 20 million at its peak in 1985 to about 12 million today. This deindustrialization turned large swaths of cities such as Detroit, Baltimore, St. Louis and Philadelphia into the industrial graveyards they are today. In these devastated neighborhoods, where the unemployment rate is sometimes more than 50 percent and youth unemployment is even higher, the police operate as virtual death squads. Drawn primarily from the most backward elements of society, and encouraged to feel hatred and resentment for workers and youth, the police carry out daily acts of violence, brutality and intimidation, interpreting any reluctance to obey as a license to kill. The American financial oligarchy has no solutions to the vast poverty and inequality that dominate American society. As with any historically doomed social class, it turns more and more openly to violence and repression to defend its power.